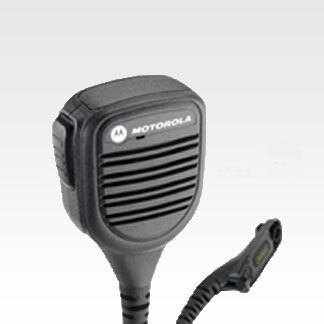 The PMMN4083 is a rugged, submersible remote speaker microphone. It features an IP68 submersibility rating, which means it can be submerged in up to 6 feet of water for 2 hours. The Windporting feature ensures you are heard when working outdoors in demanding weather. It reduces the effect of wind and other sounds whenever you use the microphone. It also prevents water from clogging the microphone and distorting your communications. These features, combined with a powerful large speaker, ensure you hear and are heard regardless of where you work.